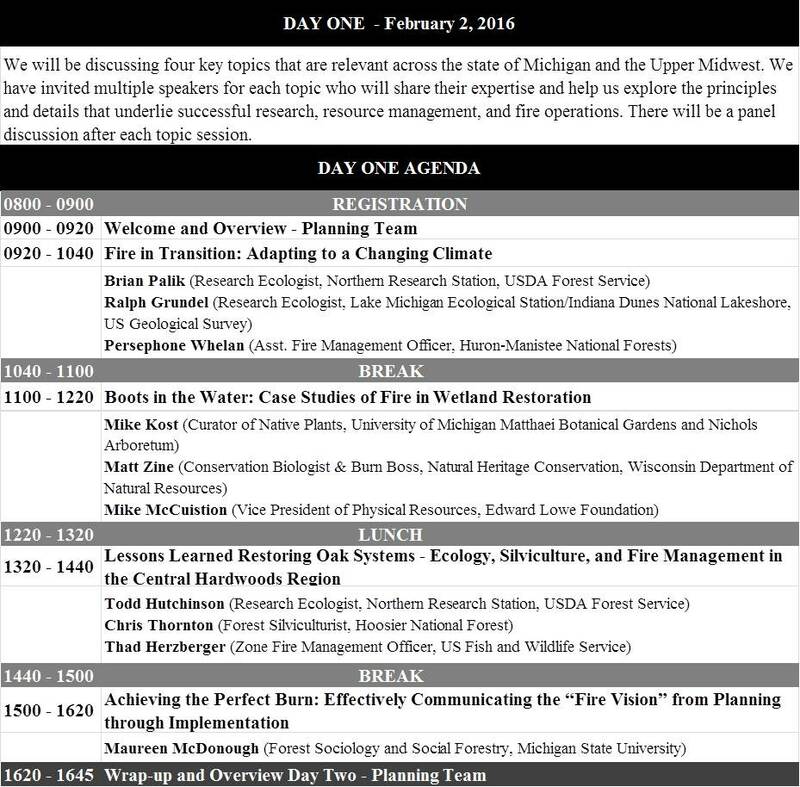 Burning Issues Symposium: How Do We Integrate Competing Wildland Fire Objectives in Land Management and Restoration? 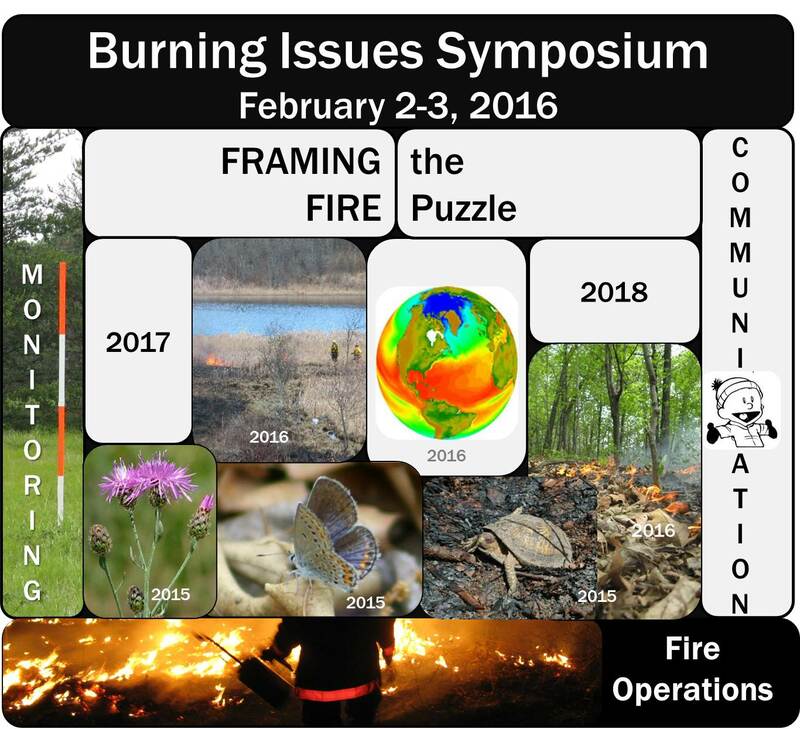 Following up on the success of the 2015 Burning Issues Symposium, we're returning to Fort Custer National Training Center (FCTC) in southwest Michigan on February 2-3, 2016. Many partners have worked to convene an event designed to help tear down the walls or road blocks that keep us from fully achieving our objectives or from performing at full capacity. Day One: This wildland fire symposium is designed for land managers, researchers, resource specialists, and fire practitioners to hear from invited speakers with many different areas of expertise. 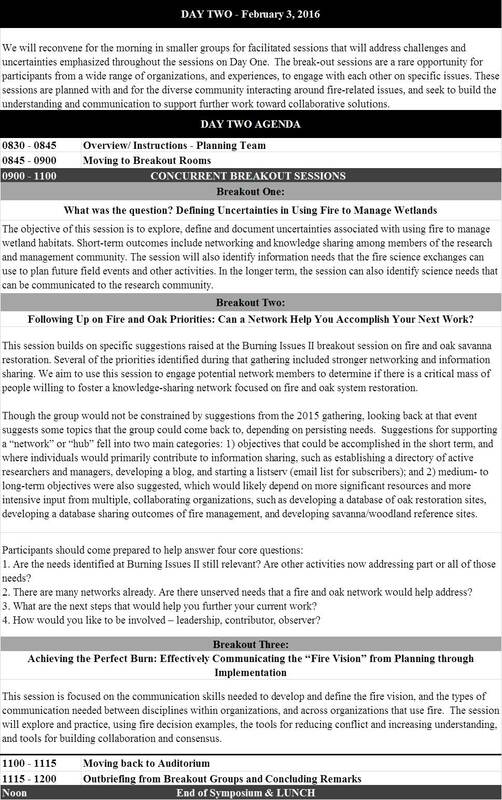 Day Two: Three concurrent breakout sessions offer opportunities to focus on one topic - with an emphasis on identifying gaps in knowledge and communication, and to support working toward solutions to issues that complicate our collective wildland fire work. Registration: Thanks to Fort Custer Training Center we are able to keep costs low with a reasonable registration fee that includes lunch, snacks and coffee on both days: Early Bird registration $55 by December 18, 2015; Regular registration $65 by January 8, 2015; Late registration $75 by January 22, 2016; and a Reduced Rate registration for students/volunteers/private landowners at $35 (Reduced Rate has limited capacity. Please contact Jack McGowan-Stinski for the Reduced Rate Code). Lodging: Available at FCTC at a maximum rate of $50 per night. Current rate is $35 per night. Note: rooms are semi-private. Rooms have a single twin bed and share a bathroom (toilet and shower) with one adjacent room. Call 269.731.6126 to reserve a room. Other lodging options are available in Kalamazoo, Michigan.